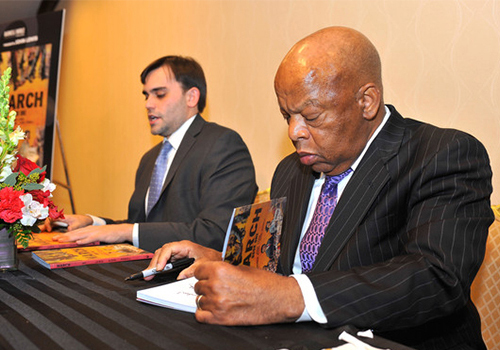 Georgia congressman and civil rights icon John Lewis signs copies of his new graphic novel memoir, ‘March: Book 1,’ along with his co-writer Andrew Aydin. Lewis appeared at a VIP reception at the Thurgood Marshall College Fund Gala held in Washington, D.C.
Washington, D.C., rolled out the red carpet recently, welcoming the Thurgood Marshall College Fund (TMCF) 25th Awards Gala to the nation’s capital for the first time. The event’s theme, Developing Minds … Delivering Dreams, echoes the work of TMCF to help students from public Historically Black Colleges and Universities (HBCUs) maximize the value of their education and foster opportunities to become a part of a new generation of global leaders. Hosted by Emmy and Grammy Award-winning comedian and actor Dr. Bill Cosby, the Awards Gala raised more than $3.8 million to support its initiatives and honored visionaries in business, education and community service who use their position to make a positive impact on HBCUs and their students. Over 500 students attended the TMCF Leadership Institute in Washington, D.C.
A number of VIP guests showed their support for TMCF at the event, including Senator Michael Brown, hip-hop artists Lil Mama and MC Lyte, Redskins running back Alfred Morris and Broadway’s original Dreamgirl, Jennifer Holliday, who serenaded the audience. 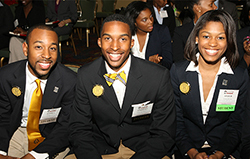 More than 500 student scholars attended the gala as the culmination of their experience at the four-day TMCF Leadership Institute, which brings together talented students and top executives from across the nation for leadership training, career management, life skills, professional development, and recruitment opportunities. Barnes & Noble College, a Leadership Institute sponsor, donated NOOK® eReaders to the conference. Students honed their social media skills for a chance to win, earning raffle tickets by sharing insights and images with their peers throughout the weekend via platforms such as Twitter, Facebook and Instagram. Civil rights leader and Georgia congressman John Lewis also took part in the gala and held a book signing at a VIP reception for his recent memoir, March: Book 1. Barnes & Noble College hosted the signing and provided copies of the book to all students in attendance. 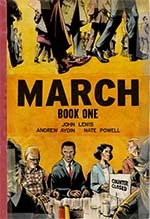 The first in a graphic novel trilogy, March was co-written by Lewis and Andrew Aydin, and illustrated by Nate Powell. The book covers the congressman’s childhood in rural Alabama, meeting Martin Luther King, Jr., the rise of the student movement in Nashville to fight segregation, and his key role in the 1963 March on Washington and the 1965 Selma-Montgomery March. The publication was released to mark the 50th anniversary of the historic March on Washington. For more information about TMCF and its initiatives, visit: www.thurgoodmarshallcollegefund.org. Barnes & Noble College considers supporting students its sacred mission and is committed to being actively involved in its campuses’ academic, social and cultural communities, and providing students with opportunities to support the causes that mean the most to them. Partnerships with nonprofit and charitable organizations allow Barnes & Noble College to join the movement to improve literacy, increase access to education and books, and fight hunger and poverty.